Today is Fat Tuesday, which may mean nothing to you unless you’re an expat from The Big Easy. But this blog celebrates regional cuisine, and nothing is more regional than New Orleans during Mardi Gras. So this week we’re taking a 2,500 mile journey to Louisiana – from the comfort of our own kitchens. If you’re in the mood for authentic Southern food, there are some really good local restaurants that deliver the goods. Miss Delta (3950 N. Mississippi) is a standout, with everything from great hush puppies and crisp fried chicken to an authentic crawfish-based étouffée. (Half the fun is in sucking the meat from the heads. Trust me on this). Side dishes like collard greens are laden with flavor – and don’t miss out on a refreshing Hurricane! Screen Door (2337 E. Burnside) is known for their humongous (and delicious) chicken and waffles, stacked high and held in place with a knife. They’ve also got really good cheese grits, and serve their Bloody Marys with pickled okra. Other hot spots to get your Southern fix on include Bernie’s Southern Bistro, Acadia, and My Brother’s Crawfish. Here in Vancouver your options are more limited, but Lapellah (2520 Columbia House Blvd. # 108) has a New Orleans BBQ shrimp appetizer and house made gumbo shows up on the menu occasionally. But really, if you’re craving gumbo, why not make a pot yourself? It does require a bit of work and finesse, but in the end, is worth it. Few dishes are more appealing than a bowl of hot and hearty gumbo on a cool and rainy day in the Pacific Northwest. And once you’ve mastered the roux, the rest is surprisingly easy! Roux is simply an equal-parts mixture of flour and fat. You can use butter or lard, but I find oil is easiest. Combine the two and stir, stir, stir. For the next hour, at least. You’ll want to start out on medium high heat and then, once it begins to darken, lower that to medium. Stir constantly, until it reaches the color of an old copper penny (for an authentic Creole gumbo) or at least a dark peanut butter, especially if your arm is in danger of falling off. 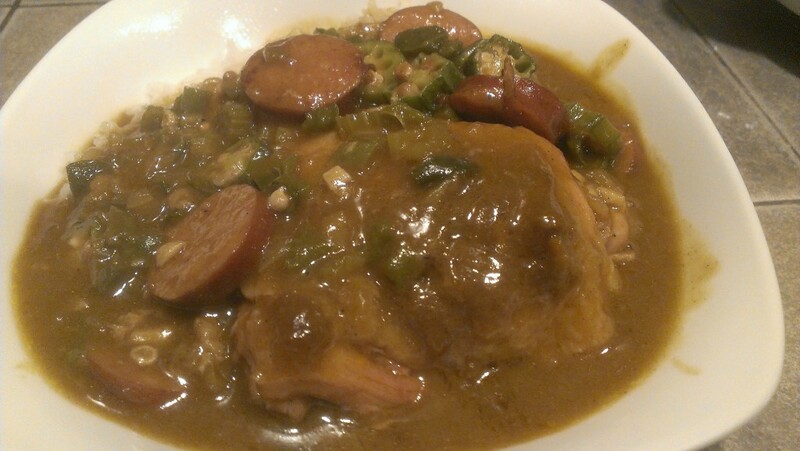 There are many gumbo recipes out there. I’m partial to Donald Link’s version, though instead of seafood I stick with chicken and andouille sausage. Either one will work. The whole process takes a good four hours or more from start to finish, so plan accordingly and don’t let this intimidate you. In the end, you’ll be rewarded with a rich, hearty and delicious gumbo that will impress anybody who has ever set foot in the French Quarter.